Race Review: OSIM Sundown Marathon Penang 2016 (by Ranjetta) | JustRunLah! 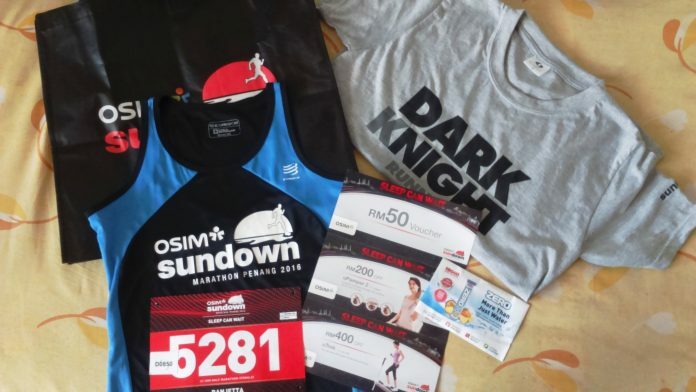 Items in the race pack for the OSIM Sundown Marathon Penang 2016. A pleasant season this year, I thought to myself, as I finished a 7k tower run last week. It was supposed to be my final run for 2016, and I was prepared to hang my running shoes for a few weeks to recover from all that street-pounding. Mindful of the fact that my last half-marathon was just a few weeks ago, I made sure to rest up the week preceding the Sundown Marathon, and performed some easy runs and leg work. I can be quite paranoid when it comes to races: I will always look for details and the logistics of the race. The webpage and runners’ handbook dedicated to the race turned out to be very helpful in helping me plan for the event. Collecting the race pack was a breeze. Located at the concierge of the Olive Tree Hotel, Penang, I was handed all my race paraphernalia within five minutes. I was glad to receive a large shopping bag which consisted of a running vest AND a grey T-shirt with some spunky description on the front; a set of OSIM shopping vouchers, and a free sample of a HIGH5 product. As sunset approached on 17 December 2016, I could not help but to feel an immense sense of excitement, coupled with nervousness. As per the guidance in the handbook, I took a bus from my campus to Queensbay Mall, Penang. The city was jam-packed that night: a carnival AND a circus was in town in conjunction with the school holidays, grouped together with the weekend and Christmas shopping. When I arrived at Queensbay Mall, I could hear a band performing somewhere. Entranced with the music, I let my ears lead me to an open and colourful stage surrounded by a number of booths. I then realised that I had reached the location of the OSIM Sundown Marathon Race Village. 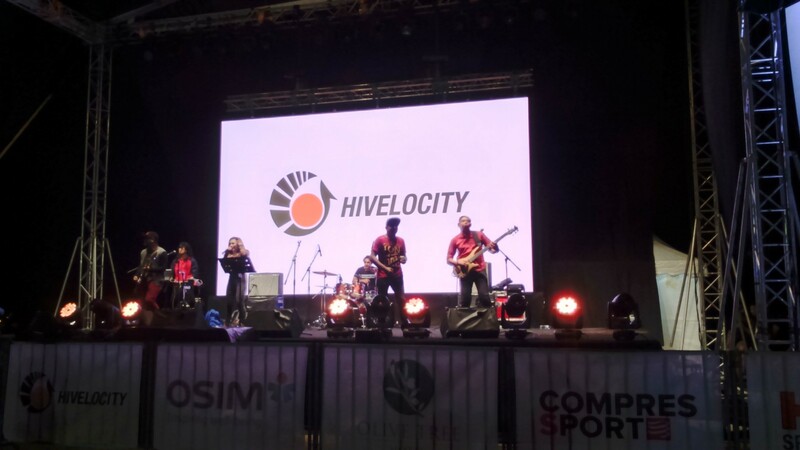 A band performing onstage at the OSIM Sundown Marathon Penang 2016. The setting and event flow of the race was spectacular: a number of live bands performed on-stage, lending an electrifying effect to the venue. This was followed by a Zumba workout 30 minutes prior to the start of the race. A photo booth was set up for runners to pose in their most resplendent running attires. Runners were also ensured to be consistently hydrated through the presence of a free-flow hydration booth. All participants were encouraged to hand in their luggage to the baggage drop team for safekeeping. Those in need of a massage could do so at the OSIM booth equipped with different types of massaging devices. The race village was almost like a carnival: people having fun everywhere. 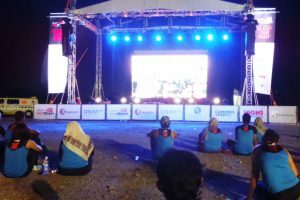 Carnival-like atmosphere at the OSIM Sundown Marathon Penang 2016. Traffic around the race route was completely shut down when midnight approached. All participants were grouped at the starting point in three pens, according to the distance registered: 21.1, 10 and 5k. When the clock struck 12 midnight, the horn was sounded, and all half-marathoners took their first strides into the race. Pacers at the OSIM Sundown Marathon Penang 2016. The route planned out for the participants involved several loops of the seaside-facing Tun Dr. Lim Chong Eu Expressway, heading towards the Sultan Abdul Halim Muadzam Shah Bridge and then back to Queensbay Mall. The route was mildly hilly, as several portions of the road were flyovers cascading over various intersections of the expressway. Each kilometre of the route was marked with a banner, making it easy for runners to gauge their pace. As I approached kilometre three, male participants of the 10k race had begun approaching and overtaking me, flying into the night. I have to admit that I was a little aghast when I noted from the handbook that only four water stations were to be provided for the race. Little did I know that water and isotonic drinks would be available freely along the route at short intervals. Each water station was strategically placed in the middle of the road, providing hydration for runners on both sides of the route. 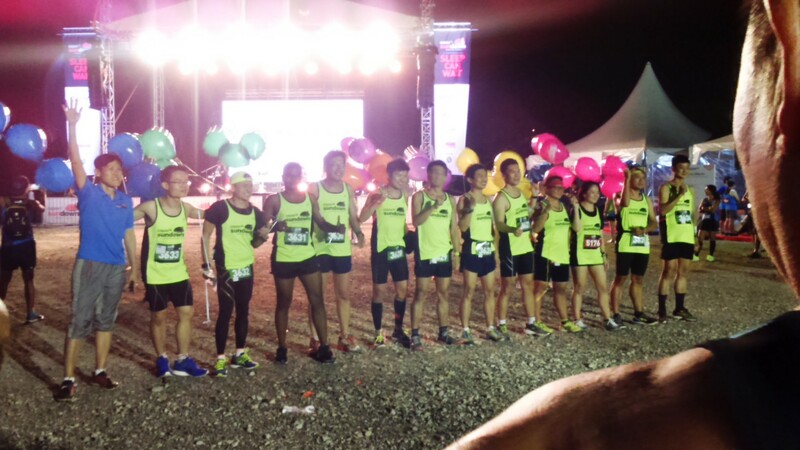 Hydration was practically a non-issue at the OSIM Sundown Marathon Penang. To further spike the adrenaline, buskers were happily singing songs at some of the stations, providing a great source of mental boost for all the tired runners that night. The finishing line of the race beckoned to me with massive thunderous and booming sounds from the race village, as if I was approaching a movie cinema. After crossing the end of 21.1k, I was led to the finisher’s booth, where a bottle of water, a can of isotonic drink, a bun, the finisher’s medal and another T-shirt (yay!) were promptly placed in my hands. As I left the booth, I realised that all the sounds were indeed coming from a movie: “Transformers 4: Age of Extinction” was being screened on-stage! Many runners and supporters sat comfortably on the ground to enjoy the movie. “Transformers 4: Age of Extinction” being screened at the OSIM Sundown Marathon Penang 2016. The movie was halted mid-way to allow for the prize-giving ceremony for the top five finishers for each category. I was blessed and lucky to have finished the half-marathon in fifth place, with a time of 1:56:38. More goodies were gifted to me: A hand-held portable massager and RM250! The movie screenings was promptly resumed after the ceremony. I was glad to make it back safely to my campus through a cab hired using the taxi listing provided in the handbook. 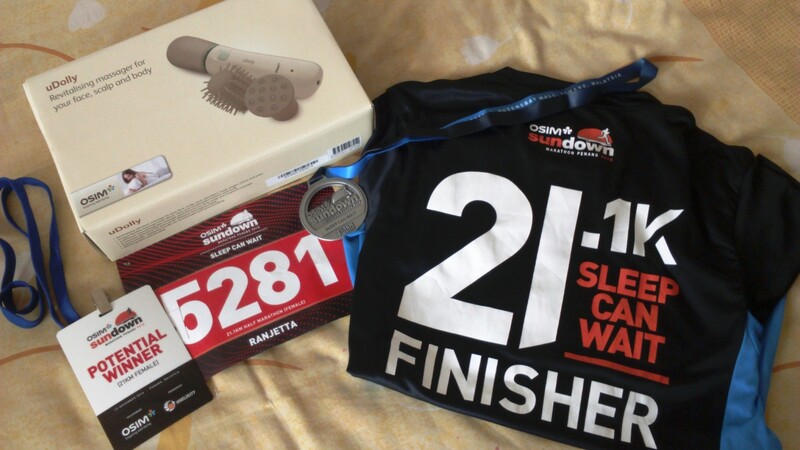 Goodies and prizes given to the author as a 21.1k finisher and 5th place winner at the OSIM Sundown Marathon Penang 2016. 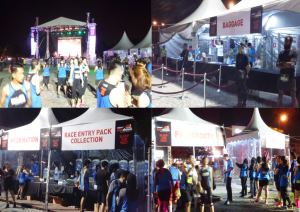 I found the OSIM Sundown Marathon Penang 2016 to be a very well-organised event. All details held dear to a runner’s heart – hydration, route mapping and safety – were well taken care of in the race. The flow of the events leading to the race proceeded smoothly with no major hiccups. 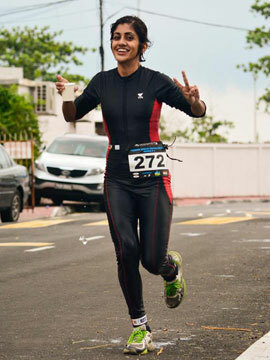 Participants of the race seemed to have enjoyed the experience at the Sundown Marathon. I would definitely consider joining the Sundown Marathon should the opportunity arise again! The author would like to thank JustRunLah and the management of OSIM Sundown Marathon Penang 2016 for gifting her with a free entry to the OSIM Sundown Marathon Penang 2016.